Foundations of Faith for new believers is a series of 10 Bible Studies around the basics of the christian faith. The 10 subjects including Faith, Salvation and Prayer are easy to understand simple Bible studies that encourage the new Christian in their faith and encourage them to ask questions about their walk with God. 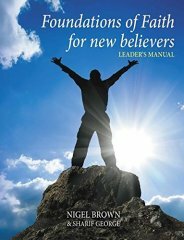 This is the Leaders Manual which has plenty of space for notes and comments for the study leader and you can also get a students manual that has helped thousands of new believers become valuable members of the congregation. Nigel Brown is the leader of the UK Christian Fellowship Churches International and pastor with over 25 years experience leading congregations and church leaders. Sharif George has been teaching Adult Bible studies for over 15 years and has written a number of critically acclaimed books with a wide range of subjects.